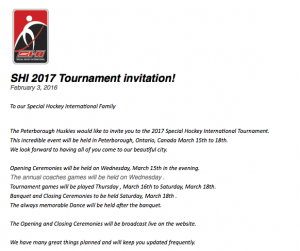 On the same day that SPICE was officially told that there was definitely no provision for a temporary ice rink, February 3rd, we received an official invitation from Special Hockey International for the SPICE JETS to attend the next ice hockey tournament that will be taking place in Ontario in March 2017. Regrettably the answer is going to have to be no as if our two teams haven’t been able to practice for six months, they’ll hardly be in a position to skate, let alone play a game of ice hockey! The last twelve months have been so good for SPICE. Firstly we were awarded the Club of the Year award by the Sports and Recreational Alliance, the governing body for such groups as the Lawn Tennis Association and the Rugby Football Union, to name just two. 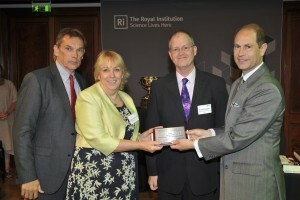 Better still, the award was presented by HRH The Earl of Wessex at an event in central London who personally recognised the good work of SPICE. A couple of months later saw SPICE back in town. This time it’s the turn of the Daily Mirror and their coveted ‘Pride of Sport’ awards. SPICE were in the final three nominations and were commended during the presentations for their work introducing sport and physical activity to young people with additional needs.This is something dear to the heart of the medical fraternity, who are keen to reduce obesity in young children. Fast forward now to January 2016 and our nation’s National Ice Skating Arena in Nottingham. Absolutely SPICE, the synchronised skating team of SPICE, also the only special needs synchronised skating team in Europe!!! 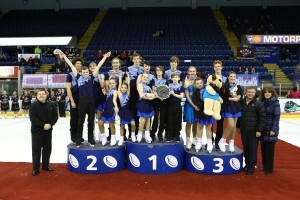 !, having been invited to perform an exhibition skate during the 2016 British Synchronised Skating Championship in Nottingham, are awarded with a trophy for the ‘most entertaining performance’ of the whole event!!! SPICE was definitely on a roll, from ice hockey to synchronised skating, our members have continued to perform beyond our expectations and teach us that important life lesson that we all need to accept – ‘never judge a book by t’s cover’. That is , until this latest news, delivered by phone, after much speculation and official emails to ‘ignore unsubstantiated rumours that had been put about on social media’!! our worse fears are confirmed. All we can say is that this news is a massive blow to our members, siblings and their parents/guardians who have put their faith in us: we are devastated and embarrassed to not have an immediate solution. This time though, we’re stumped. You need an ice pad to ice skate. Without one, our SPICE members are going to lose the one thing that gets them out of bed on a Sunday morning and the one thing that makes them special. They live for SPICE during the week. The idea that we can say, ‘See you in twelve months’ is simply nonsensical. 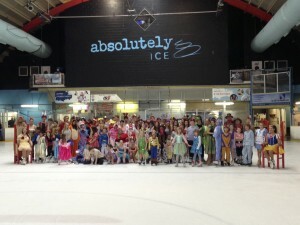 What started in 2002 in the corner of the then, Slough Ice Arena, for half a dozen young kids with special needs, has grown into 120 members, siblings and volunteers that come out onto the ice each Sunday, fifty two weeks a year. Fifty two weeks a year? Our members don’t like change. If it’s Sunday, it’s SPICE. Take that away from them and you’re damaging their wellbeing far beyond the couple of hours that they are on the ice. 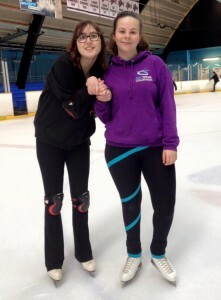 We’re a voluntary organisation, set up simply to teach children and young adults with special needs to ice skate in a calm and caring environment. We’re still running a waiting list for new prospective members to join. Not sure what exactly we should be saying to them and what the future holds for SPICE both during the closure and once a new management team have been appointed by SBC. Will they be prepared to give us premium ice time every Sunday morning as Absolutely Leisure have done, all these years? SPICE, Special People on ICE, the stand out performance for so many Christmas ice shows, now looks to be in real jeopardy, unless Slough borough Council can review their decision and support Absolutely Leisure, the current ice rink management team, in their proposal to keep ice skating alive in Slough whilst the rink is refurbished. There is another rumour starting to develop, that one, we don’t even want to contemplate.